Kanye West Sues Lloyd's Of London Over Life Of Pablo Tour Cancellations : The Record The producer and rapper is hoping to be paid on an insurance claim after he canceled several shows in late 2016. Kanye West performs during his Life of Pablo tour in California on October 25, 2016. 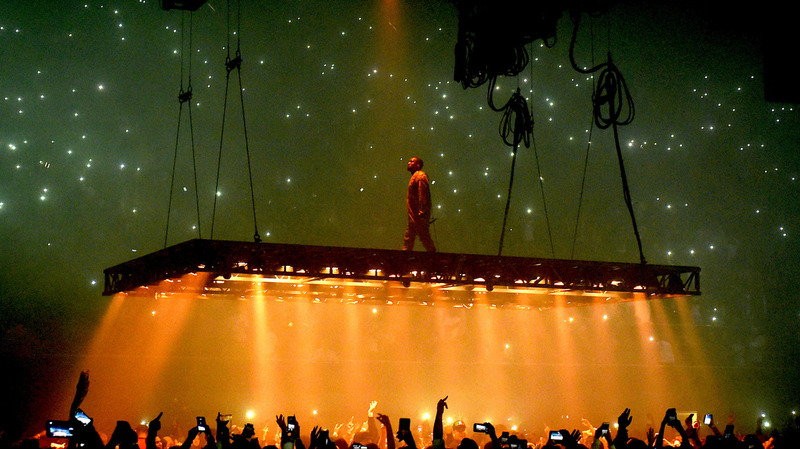 Last year, Kanye West's tour in support of his album The Life of Pablo was inarguably star-crossed. On Oct. 2, West's wife, Kim Kardashian-West, was robbed at gunpoint in Paris, resulting in the cancellation of two shows (one which of which he walked out mid-set after hearing the news). Seven weeks later, the producer and rapper was admitted to the UCLA Neuropsychiatric Hospital for eight days. As a result, West canceled the rest of the scheduled tour. Tours like West's come with huge overhead; highly produced, at venues that are expensive to secure and necessitate a sizable number of employees. The insurance policies behind these tours are commensurately expensive, too. Now, West and the touring company Very Good are suing to get an insurance claim paid by Lloyd's of London. In a suit filed yesterday in a U.S. district court in California, West's lawyers accuse Lloyd's of employing various tactics to invalidate West's claim for $9,860,843.51. "The artists think they're buying peace of mind. The insurers know they're just selling a ticket to the courthouse," West's lawyers write. The lawyers say three other insurers have already paid claims made on the tour. West's lawyers also accuse Lloyd's of leaking information to the press and of requesting examinations under oath — to which West and eleven others assented — as a stalling tactic. In the filing, West's representatives also assert that Lloyd's has indicated that "Kanye's use of marijuana may provide them with a basis to deny the claim." It's not the first time Lloyd's has been accused of employing the same strategy. A very similar case was brought against Lloyd's by the Foo Fighters last year after some of the band's shows were canceled due to Dave Grohl's broken ankle and the terrorist attacks in Paris. The group's attorneys even used similar language as West's do here, accusing Lloyd's of "a seemingly never-ending series of requests for increasingly irrelevant information." The case was settled four months after it was filed. "It seems to be [Lloyd's modus operandi] — they kept asking for more and more and more paperwork, for a year, on the broken ankle" that Grohl suffered on tour, "and the terrorism claim for six or seven months," Jill Penwarden, a lawyer for the Foo Fighters in that case, tells NPR. A spokesperson for Lloyd's told NPR in an email today that the company would not comment on specific suits, but had paid £14 billion in claims over the last year, and that it "always take steps to find a solution amicable to both clients and insurers where there are disagreements ... However, where an agreement cannot be reached, valid claims can only be paid on syndicates being satisfied that they have the information required to make any payment." This article was updated at Aug. 2, 3:14 p.m. with additional comments from a lawyer involved in the Foo Fighters' suit against Lloyd's.